Isaac Asimov- Pebble in the Sky: Haven’t read. C.S. Lewis- The Lion, the Witch, and the Wardrobe: It’s Narnia, what else can I say? It’s fun. Edward E. Smith- First Lensman: Still need to read it. Jack Vance- The Dying Earth: Amazing author, but haven’t read this one. Background: We’ve got another retro Hugo! Coulda sworn that we wouldn’t have any for a bit, but guess I was wrong. Anyhap, one of my favorite books of all time. 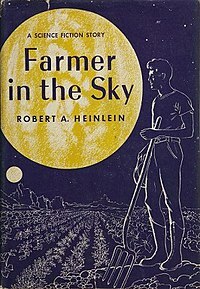 Heinlein’s young adult novels were what really kicked me into SF/Fantasy at a young age, along with the Hobbit and Star Trek. I’m not sure I can make myself say anything bad about these books, at least not easily. This book was the first time I recall encountering the concept of terraforming. This book was originally written in segments for serialization in the magazine Boy’s Life, so there are pervasive references to the Boy Scouts. Synopsis: Earth has reached a Malthusian future, with overpopulation shenanigans everywhere. The main character, his widowed father, his stepmom and stepsister all move to a terraformed Ganymede to homestead. They start a farm, deal with the settler life, interstellar politics, a Ganymede-quake, and vampire bear clowns. One of those might not actually have been in the book. Not saying which one. Verdict: I can’t really give a fair verdict here, given how much Heinlein’s YA stuff affected my reading habits, but this is a really good one. This is one of the most accessible SF novels I’ve ever read, and for good reason. Still, though, I think this one definitely deserves the Hugo. Trivia: Shockingly, for a book from the 50’s, some of the science is incorrect. The planetary alignment featured in the book can’t happen in real life, and the surface of Ganymede is very different than Heinlein envisioned it.